Built in The Cliffs in 2007, this fantastic 4000 square foot lakefront gem has a commanding view of Lake Keowee on the pristine northern end of the lake. Only a cove away from the waterfall it is the perfect spot for the luxurious seclusion for which the gated Cliffs Falls South community is known, with crystal clear water and miles of unspoiled shoreline augmented by crisp mountain mornings year round. A long covered porch for hours of restful daydreaming as you absorb the spectacular scenery. South Carolina Department of Parks, Recreation and Tourism featuring Devil's Fork State Park , conveniently located near Jocassee Outdoor Center. Look for continued partnership developments between Devil's Fork and J.O.C. that will better your time at the lake. 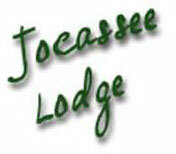 For the best in Lake Jocassee lodging, the Jocassee Lodge is the place to call home for your stay at the lake. Meticulously kept and decorated, this property is one to impress the family and friends for your getaway. Remember, Jocassee Outdoor Center will be happy to provide boats, jet-skis and/or fishing guides for your stay. try the nearby Sunrise Farm Bed & Breakfast. Lake Jocassee Vacation Rental Home. Welcome to Maplecrest a wonderful mountain home available for vacation rental throughout the year. Located in the Highlands of South Carolina. Maplecrest is nestled between Lake Keowee and Lake Jocassee just off the Cherokee Foothills Parkway. This quaint mountain retreat on 2 acres is less than 1 mile from the boat ramp at Devil's Fork State Park and just 30 minutes from Clemson University. During your stay, the Jocassee Outdoor Center can provide you with boat rentals, fishing equipment, food, drinks and anything else you might need for your Lake Jocassee adventure. This spectacular South Carolina vacation rental home is located just a few miles north of the Foothills Highway 11, in the Foothills at the edge of the Blue Ridge Mountains, just 20 miles from Clemson, and approx. 15 miles from the Chattooga River, Lake Jocassee, Lake Keowee, and the historic town of Walhalla, SC. The many nearby lakes, rivers, and waterfalls, including the spectacular Whitewater Falls, make this a great area to explore. 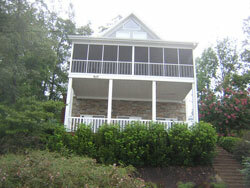 This vacation mountain lake home is available for rent, directly from the owner, saving you money. Clemson Tiger fans will find this a great convenient spot for staying for their football and tailgating weekends. This eight year old beauty has the feel of a Montana mountain retreat. Just steps away, your private swim dock is in a secluded cove where you can enjoy swimming and boating in the crystal clear water. Want to water-ski in the middle of the day on the weekend? No Problem, no boat traffic!! Adventurous? Park your boat at the head of one of five major trout streams, and enjoy a cool afternoon of rock hopping and trout fishing. Feeling lazy? Park your boat at one of nine waterfalls which feed directly into the lake and nap with the soothing hum of falling water where the temperature is 10 degrees cooler than the main body of water. Love to hike? Trailheads are on the lake and two miles from the house. After a fun filled day on the water, come back to your home where you can swing in the hammock and admire the sunset as you BBQ on your 50 foot x 16 foot deck overlooking the cove and dock. 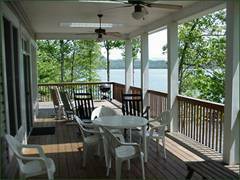 This vacation home is located less than one mile from Lake Jocassee, Devil's Fork State Park, and the park's boat ramp. Set among 2.5 private wooded acres this home is also convenient to Lake Keowee(3 miles away) and Clemson(23 miles). Hikers can access the area's many trails as the area borders tens of thousands of acres protected by the state, Forest Service, or DNR. Guests can reach trails with views of distant Table Rock within 1/2 mile. The House has three bedrooms, plus a loft and two baths. Downstairs has the master bedroom, great room, one bath, kitchen, mudroom with laundry and a dining area. There is a large screened porch, plus a deck off the great room, The master bedroom has a queen-sized bed. The great room has a queen sized pullout sofa. Upstairs contains two bedrooms (with TV's)and one bath. One upstairs bedroom has a full sized bed, and the other has 2 twin sized beds. The loft has a full sized futon, card table, and games. The great room is very inviting and open to the dining area, kitchen and porch. There are two sofas and a recliner in the great room, plus a wood burning fireplace, and a TV/DVD/VCR. There is a nice selection of DVD's and VCR tapes and books on local activities and attractions. The kitchen has a bar for eating that separates it from the great room. The huge screened- in porch has a daybed, TV, rocking chairs and a dining table. There are chairs and a grill on the deck. The house is 2800 square feet on three levels. 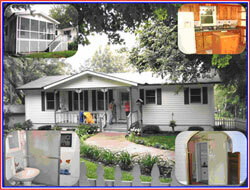 There are four bedrooms, three full baths, living room / kitchen area, and a basement with sofas and two single beds. Each room has a different wood paneling. The main room is wormy chestnut, while the bedrooms are oak, pine, cyprus, and ash. The house will sleep 10 in beds. Come relax and play at Bear Pond Cabin. Our new South Carolina vacation log cabin is situated on 2 wooded acres with a stocked fishing pond. We are only minutes away from Lake Jocassee and Lake Keowee on Hyatt Dr. in Salem. Our log cabin with all wood interior and full amenities accommodates 6 people. We offer 3 bedrooms and 2 full baths - 1 with a jucuzzu tub, a fully supplied kitchen, washer/dryer, central heat/air, linens/towels, wood burning fireplace, covered back porch and a small boat for your use on the pond. Our cabin is decorated with our owner's paintings of scenic views and wildlife. Visit our friends at Jocassee Outdoor Center and Keowee Lake Shop for your supplies, gas, and boating needs. They will be happy to help you with water toys, kayaks, boats, jet-skis, and fishing guides. Carolina Getaways provides a comprehensive Visitor’s Guide to the North and South Carolina mountains. Whether your plans include sight seeing along the Blue Ridge Parkway, hiking the Appalachian Trail, spending the weekend at a mountain festival, dining out in an ambience filled restaurants, viewing the work of accomplished artists in their galleries or studios, or visiting any of our myriad historic sites, this travel guide will be most helpful to planning your visit to the Carolina Mountains.